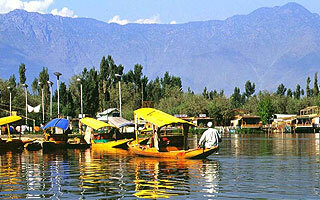 Snow capped mountains, stunning gardens, large mosques and Shikara at Dal Lake makes Kashmir truly beautiful as heaven. Being northernmost state Kashmir really looks as crown of India. Almighty has blessed this state with astonishing natural beauty. A visit to Gulmarg and Sonmarg will add on the charm of travelling to this amazing state. Phalgam "Valley of shepherds" is famous for trekking routes and is also the base camp for famous Amarnath Yatra. On the arrival at beautiful Srinagar, our friendly tour representative will welcome you with heartfelt hospitality and transfer to the hotel. Check-in to the hotel and get relax for a while. In the afternoon, get fresh and dress-up to visit Mughal Gardens. Mughals gardens are perfectly lay-out and offer scenic environment to enjoy by the visitors. The world famous Mughal Gardens in the region are Nishat Bagh - The Garden of Pleasure and Shalimar Bagh - Abode of Love. Observe the incomparable beauties of the lush green locations. Next, you will enjoy boating in the Dal Lake. The surrounding of the picturesque lake is amazing and there are many scenic locations that can be enjoyed with great enthusiasm. Overnight at Houseboat and you will observe the beauty of water-body. After morning breakfast, dress-up and get ready to drive towards Sonmarg. Somnarg is a beautiful place in the region and overflow with amazing landscapes. Explore the destination and make the visit an unforgettable experience. Return back to Srinagar and overnight stays in Srinagar Hotel. After morning breakfast, check-out from the hotel and drive towards the valley Pahalgam. The beautiful area is located at a distance of 2440 metres from the city of Srinagar. En-route you will visit Avantipur Ruins Temple and Saffron Fields. On the arrival at Pahalgam, check-in to the hotel. Relax for a few minutes and enjoy tasty lunch in the hotel. Pahalgam is also named as Vale of Kashmir and it is the popular place for Bollywood Film Industry. After lunch visit the mesmerizing sites of Pahalgam. Back to the hotel and overnight stays. After morning breakfast, get ready to explore the amazing beauty of Pahalgam valley. Pahalgam valley is one of the most wonderful lush green destinations in the world where nature lovers and adventure enthusiasts can spend some quality time with their travel partners. The venue is also renowned as the Valley of Shepherds. Back to the hotel and overnight stays lavishly. After morning breakfast, check-out from the hotel and get ready to drive towards the beautiful Gulmarg. On the arrival at Gulmarg, check-in to the hotel and get rest. The summer resort Gulmarg is the most demanded place of holiday in India by the domestic as well as foreign travellers. Spend some quality time in the golf course. Enjoy playing in the lap of Mother Nature. Enjoy Skiing and Gondola Ride. Gondola Ride is quite interesting and start from Gulmarg and ends at Khalinmarg. Enjoy the features of nature in its true colour here. Back to the hotel and sleep comfortably. After morning breakfast, pack your bag, check-out from the hotel and ready to drive towards the city of Srinagar. Our tour representative will transfer you to the airport to catch your flight. Hope you enjoy your glimpse of heaven on earth tour in Srinagar with tone of memories. Here the tour ends.